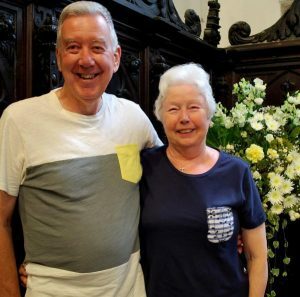 Memories of one of the most important days of their lives were revived for visitors Ian and Gail Campbell when they called at St Edmund’s Church, Sedgefield. 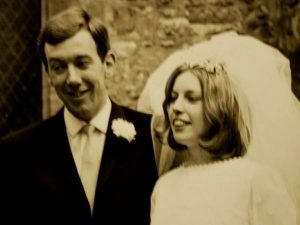 The couple, who now live in Bedfordshire, were married at St Edmund’s on August 3rd, 1968, by Canon Hancock. “It’s amazing being back here. The church is not nearly as gloomy as we remember it”, they told churchwarden Brian Mutch who gave them a tour of the building and outlined some of the improvements made in the last half-century (including a new lighting system). Gail was born in Durham but lived at Winterton from the age of 3 until she was 22. Her father was chief fire officer there and her mother was a committee clerk. From Winterton, Gail moved to Sedgefield and taught biology at a Billingham secondary school after leaving Hull University where she met Ian. They now have a son, Matthew, and a daughter, Sara. It isn’t the first time Gail and Ian have been back to St Edmund’s. They returned for the funeral of Gail’s father, Matthew Henry Robson, in 1979.